Whether it's the Lycra-clad road racing devotees, the fixie bike-sporting hipsters or the sustainability minded commuters, Melbourne is heaving with cycling enthusiasts who prefer to head everywhere on two wheels. While each sub-group might have considerably different goals in mind, they all share one thing in common, as does everyone in this town: a love of damn fine coffee. We hopped on our bike to source the best bike-friendly cafes in Melbourne to pull up for a hearty dose of caffeine, whether it's a quick stop on the way to work or a punishing coastal cruise with the peloton. Feel free to let us know your favourite spots too. Commercial Road's trendy bike and accessory joint À Bloc in Prahran has struck upon the perfect combination, inviting a Clement Coffee pop-up to set up shop in store. As well as the holy bean manna, they'll be dishing up Matt Forbes' pastries and donuts to keep your energy up for the ride while your peruse the goods in this big, bright, warehouse space. There's a similar set up at Camberwell's Bike Gallery, with the on-hand espresso machine pumping out the good stuff from Hawthorn legends Axil Coffee Roasters. They sell some pretty spiffy bike gear too, including Rapha, who produce the kit for the world's current numero uno road racing legends, Team Sky. 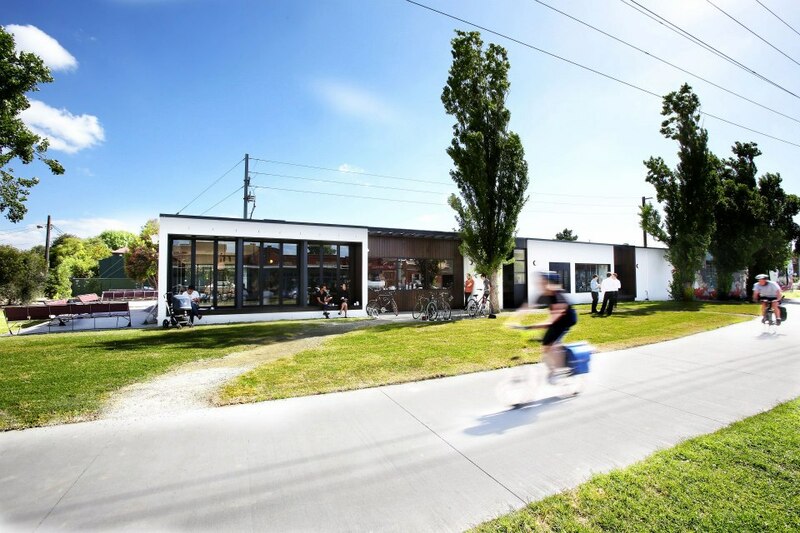 There are a handful of great bike-friendly Bayside spots for peloton riders, including St Kilda's long-serving Café Racer on Beach Road. It's had its ups and down over the years, but it's still a handy part of the scene, with several riders heading there for their early morning coffee post-ride. Marine Parade's The Great Provider is another choice spot, as is Black Rock's Café Velocino, also on Beach road. Also try out St Kilda's Phamish and Dr Jekyll, and check out the gorgeous Salford Lad's Club in a random industrial estate in Port Melbourne. The have their own bikes hanging on the walls inside. Sevens Seeds' pop-up Café Hortus is a rare gem down in Docklands – a whacky greenhouse affair serving up their beans amidst lush greenery on Harbour Esplanade and is very bike-friendly. Total Rush Cycling next to Richmond Station is another one-stop-shop for bikes, accessories, clothing and damn fine coffee with love from Kiwi outfit Coffee Supreme. Image credit: Graham Denholm 2012, St Ali North Facebook. Heading north of the river, Collingwood's South of Johnston has a great outdoor area up front with lock points on their planters, making it ideal for cyclists on a quick pit stop. The same goes for Gertrude Street's De Clieu, with deep window seats outside, two steel rings for locking up bikes, and big windows street-side to keep an eye out. St Ali North in North Carlton caters for the hipster crowd in particular, but also for the roadies and commuters, with Nicholson Street's Velo Cycles a handy next door neighbour, plus it happens to be right in the middle of the Capital City Trail. You can pump up any flat tires for free and Velo's crew are on hand to offer on-the-spot fix ups. Seven Seeds in Carlton has mighty fine coffee and indoor bike racks. In the quirky surrounds of the gorgeous Abbotsford Convent, The Convent Bakery is a ride up, bike-friendly, caffeinated destination that just so happens to be pretty handy for the Yarra Trail and also for Kew Boulevard, aka 'the Boulie', one of Melbourne's most popular road riding spots. Also in Abbotsford, Three Bags Full is a bike-friendly cafe with banging beans from Five Senses, and a real hot spot for cyclists on a Tuesday morn. Just opposite Fairfield Station, Fifteen Pounds offers peace of mind because you can take your bike in and park on the racks out back and not too far away, the next suburb over in Alphington, Apte has good parking up front and runs with Five Senses. Did we miss any of your favourite bike-friendly cafes, people?